This fixes several issues in beta 3, including one critical bug that can eat up space on your hard drive -- if you were using beta 3, please follow these directions to fix the problem. I should add-- if you encounter a bug, please take a second to file a bug. It helps me out a lot. I use the list as basically a to-do list for release. You can get the beta on Bitbucket. I replied on my last 'issue' with Beta 3. - Everything seems to be fixed except Passage Titles remaining the Dark Theme's BG color. (Inside the Passages themselves, that is. They still show normal when you look around at the Nodes in the main project workspace. So are the story format icons supposed to be gone from the betas? 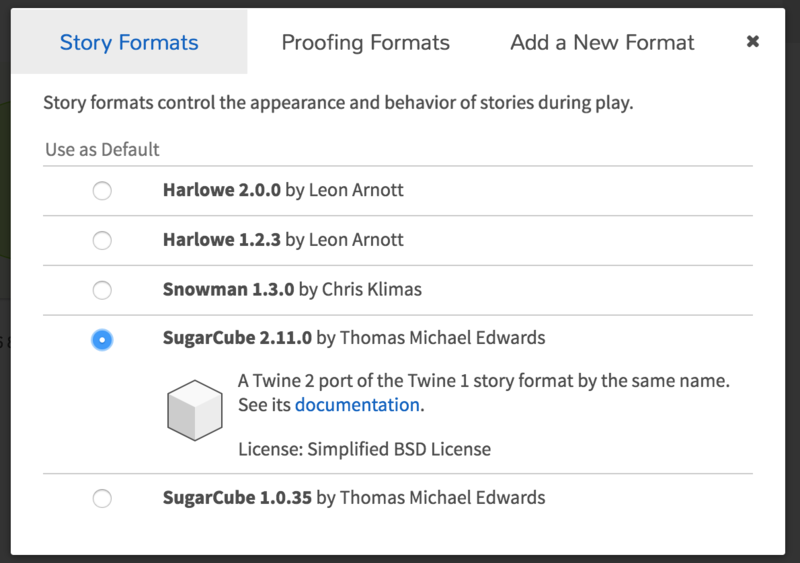 The story formats popup looks very different from the previous one, and I can't tell whether it's supposed to look that way. (Screenshot attached, Mac/Mavericks as usual.) If so, I find the new reverse tab highlighting perpetually confusing. Yeah, I changed the dialogs around -- the changes are driven mainly by the fact that we have multiple versions of story formats available now, so having the big icons a) was redundant b) used up a lot of space. When you're picking a story format for an individual story, you do get more info, including the icon. I also wanted to use real radio buttons for the sake of both usability and accessibility, instead of the checkbox icons that are in the 2.0 series. To me, they never felt click-y enough, and I always felt the star icon buttons were not really clear as to what they did. The new tab appearance is to make it consistent with the Sort By options on the story list, though it's good to know that it looks confusing. That's useful feedback. So to sum up, I don't think this new design is perfect by any means, and I'm open to suggestions. I'd still like to see a documentation link property within the format properties and to have it exposed in various places. Issue 301: Link to format documentation. It looks good. Unfortunately I couldn't build it because I was using the grunt task for the osx package before and it's gone. I'm also very confused by the reversed tab highlighting. The info about format and docs link are great though. That might not be the right place and time to ask, but do you have any sort of an estimated release date for 2.1 stable? Also does anyone know about the Harlowe 2 development: how stable is it and is there a stable release coming anytime soonish? I also noticed when I sorted my stories tonight - (by Date), I noticed that the rest of my stories were created/updated on the 22nd. Which is frankly not true - I haven't touched most of them for a month or three. The only one file is updated is my main project. Although this could be a remnant of beta 3. Dunno. It's not a critical bug for me - mainly cuz I don't really care when things were modified. But others might. I tried the new beta under Mint 18 after cleaning the cache as exposed. No more saving of the stories... The test button only reverts to the first screen with the library of stories. Impossible to use béta 4 for me. That is better—though it doesn't address my real issue. That said, I prefer the layout of the story editor format window—from the "Change Story Format" menu item—where the info is placed to the side of the radio buttons. @Phalcon, I'm shooting to have 2.1 out by the end of the calendar year. I can't really speak to the state of Harlowe 2.0. @Gryphbear, do the dates change on every app startup? Beta 3 had an issue where it was bumping the update date on every story when it first started. @Pierre, the issue with play/test should be fixed in the next beta. See here for details. I can't tell for sure, are you saying that the editor is not saving changes at all for you? If so, please open a bug for that, as that isn't an issue others have reported thus far. @klembot - The dates have stayed the same, so I'm assuming it's stabilized. The one project I Just updated states it's been updated on the 24th, the rest are still showing as updated/created as of 2 days ago. So, no, it doesn't seem to be bumping the dates anymore. I'm not quite sure if I updated from beta 3 to 4 two days ago or not. By Midnight on the 25th, I should know if it bumps the dates up. @klembot Okay - I've edited my TWINE until after Midnight. The dates are still stuck at Nov 22 for the unedited stories and Nov 25th for my latest edited Project. So the dates seem to be stable. I'll try that. The build I was attempting died in the wine phase (and left a runaway wine process running that I noticed later), so I never got an OSX build out of it. Posted another bug to bitbucket - although I'm not sure if I tripped it by accident or if it was something you already knew about. That went better, though I did find a bug (#303) or two. Btw, hope those reports are helping you make a better, stronger, faster TWINE release rather than annoying you or stumping you lol. Seriously, this is just part of the process of getting a release out, and I'd much rather fix things now than after letting the world at it. @mcd, that error has been a thorn in my side. I need to rewrite the build process to do the Windows builds in a separate step, as that was the only way to get them to work consistently in the past. The workaround I use is to killall wine.bin and rerun. It seemed to be, though I don't really know why, that once the error happened in one session, it wouldn't happen again. There are a lot of complaints about errors. I've added a couple myself over the course of this new beta. But it is only because the new version is really good, and we are anxious to start using it. I just wanted klembot to know we are appreciative of all his efforts, and we'll try to be patient, even though we are eager to see the new version come out.